10' Event Tent is the next level in outdoor advertising. 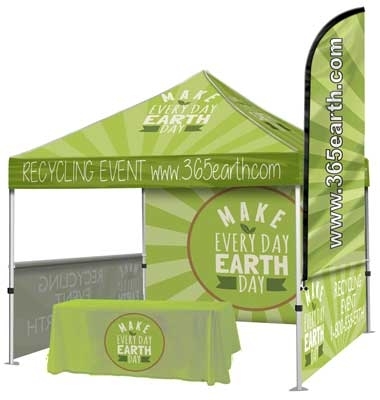 Achieve 360 degrees of branding with a custom full fabric dye-sub canopy and hardware package. Canopy is full printed. 6 oz. Tent Fabric (600×600 denier). Heavy duty hex shape 40 mm. aluminum hardware. Package also 6ft table throw, full back wall, two half walls & 10ft single sided flag. Imprint detail: 8'' x 3''. Comment: Please Call for Quote on any Larger Quantities.